For the icing: Combine powder sugar, milk and dulce de leche. For the tart: Wash and cut the apples into thin slices, preferably with a mandolin so they can all be even in thickness. Remove seeds. Place on a large cookie tray. Sprinkle with brown sugar and bake for 3 hours at 200 °F. Remove from oven and set aside. Adjust oven temperature to 350° F.
In a blender, combine cheese, vanilla, sugar and flour, and set aside. Unroll Pillsbury™ dough on a 13 x 9 baking dish. Add the cheese mixture to the middle, place apple chips over the cheese and seal by overlapping the triangles of dough. Remove from oven, let cool and cover in icing. Serve and enjoy! You can use your favorite fruit jam instead of apple chips. You can also sauté the apple chips on a frying pan with 2 tablespoons of butter, brown sugar and 1/4 teaspoon cinnamon. This Danish tart offers the perfect opportunity to get together with your friends and enjoy a cup of coffee or tea. It’s very easy to make and the result is delicious. 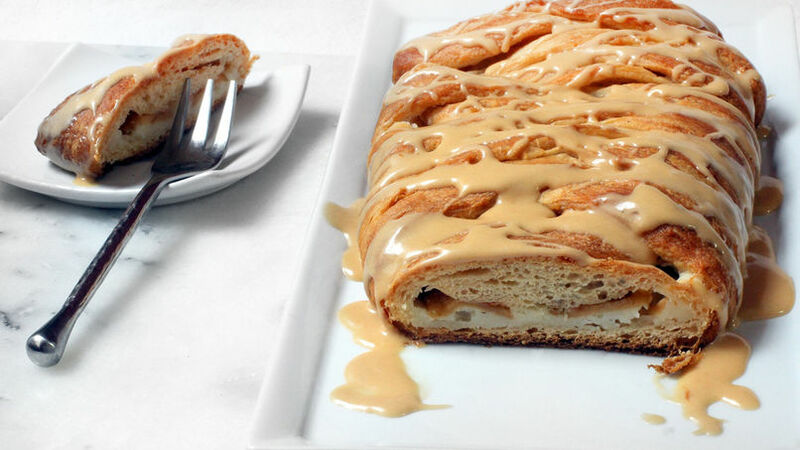 This time, my secret ingredient is dulce de leche, which along with the cream cheese gives this tart a unique and delicious flavor. It’s ideal for whenever you have special guests. Enjoy!